They were an assembly of those considered most qualified to direct the collective destiny of an entire society. These self-appointed gods congregated in a fashion that mimicked the most glorified legislative bodies from the long lost Olympian societies shrouded in myth and perpetuated through legend. Usually, the life and death implications of their decisions played out in the long term, manifesting themselves into consequences so far removed that to most how it might be connected mystifying. For the first time, the executors of Teranasima had to literally dole out death sentences to a wayward mass of people their data models had deemed to be “excess population.” Peoples whose very existence had been cultivated by more favorable circumstances that no longer existed. Just like the ruling bodies of the past they were attempting to duplicate they were also a collective of individuals with conflicting self-interest, values, and visions. They started out convinced cold logic would provide a unifying and uncontestable course of action in all situations. Inevitably this self-denying ideology lead them to an impasse and eventual paralysis in the face of disaster. “That’s disgustingly cynical!” Another voiced chimed in. The orderly debate fragmented into several different arguments. Chief executor Haber had deliberately refrained from contributing anything that might sound like a personal opinion preferring to act as an official mediator in the deliberations. This helped preserve the illusion that his input was uniquely free of personal bias. He banged his gavel, and the squabbling petered out. After he reigned in the squabbling, he took a moment to let the silence settle. He stood up from his chair and slowly scanned the chamber from left to right establishing brief eye contact with everyone in the room. He waited for a moment while his audience contemplated his rhetorical question. “It wouldn’t be such a difficult decision if the scientific facts were given proper regard!” Someone shouted angrily. The murmuring resumed, but Haber was unshaken by the interruption. “It is to anyone with any sense,” came a begrudging mutter. Haber grinned playfully. “Look we have to face the fact psychology confirms each of us on an individual level can’t come out and condemn a considerable portion of the population to death. We trust in reason, trust in fact, but that doesn't mean we aren't afraid of the guilt and restore each and every one of us will inevitably experience.” Thier silence was telling. They knew Haber was offering up an uncomfortable truth and not a single one among them had anything to offer once they were confronted by its ugly simplicity. “As large as this colony is it is also heavily monitored and tightly controlled. The atmospheric sensors, the food, and water distribution systems all of it is precisely controlled by real-time data. These systems already know what needs to be done. It’s safe to say our input is not required or even wanted in this situation. Right now data models are being analyzed that will give us the solution with the best possible long-term outcome. There is not a variable being overlooked and not a possibility being unexplored. This decision thankfully is out of our hands.” Haber concluded with a shrug. “I don’t know about all of you, but I’d like to know the methodology behind these models!” Someone shouted from the back row. “Of course,” Haber agreed earnestly. “Your staffs have already been given the full reports, and of course you can look over them yourselves. Just please bare in mind the clock is ticking,” Haber grimly reminded them. “Fear not I know this executive body will choose wisely,” Haber assured them. The earth is scattered with the remains of dead civilizations. Once sprawling mighty metropolises that had receded to their core. Thier bustling centers now remote and forgotten places reclaimed by the natural world and buried under several stratospheres of time. None of these forgotten carcasses rotting away in an overgrown jungle or eroding in the sun-baked sands of the deserts came with a date of time of death. The when and how were subjects of infinite speculation. When these human composed supraorganisms ceased to be was subjective. Often their remains broke down, and those elements persisted in what came next. TerraVitae there was a very accurate date and time for what could be categorized as a collapse. The automated systems that regulated and monitored human activity determined by all metrics civilized society had become impossible and predetermined measures were immediately implemented, the system’s so-called Malthusian protocols. Armed security systems saturated critical facilities with nerve agents and when the buildings were cleansed of human life the doors were sealed, and turrets were deployed to guard the entrances. Food production and water purification processes ceased, and the entire colony went into a low power, safe mode. The monitors and administrators on Olduvai were aware the colony was having population control issues, but the simple mathematical solution led them to believe it was under control. Something else happened on TerraVitae. There was something plugged into the grid that began consuming massive quantities of energy. It was too much for the network of reactors to keep up with but for some reason whatever it was could not be shut down and so the system had to compensate or suffer an inevitable meltdown and render the planet uninhabitable. Since the parasite could not be extricated the only way to stay alive was by cutting off the colonists. Whatever was leaching on the colony’s energy couldn’t be spotted from space which meant it had to be somewhere underground. TerraVitae were an extreme anomaly. Places that formed despite incalculable odds and to the planet’s distant masters that made it invaluable. The survivors were few and scattered having disbanded into small clans to try and scrape out a desperate existence on an alien world. It was safe to assume they saw the red glow of the ship as it penetrated the atmosphere.They may have been oblivious to it, but the galactic travelers had detailed records on them. Even though the plummeting population had leveled off into something more sustainable, the people had regressed back into a primitive state and could never be acclimated into a high-tech civilization. Thier fate was a foregone conclusion but there was a good chance what their predecessors built could be salvaged for future settlers. The ship had suffered a hard landing. The wrecked vessel smoldered in a small crater. The lock on the hatch disengaged and the metallic door opened partially before its gears jammed. Something hit it from inside, and it bulged outward. There was a second thud, and the hatch tore away from the ship and flew into the air. Despite the condition of the landing craft, the small exploratory party was mostly intact and functional. The first two emerged from the lacerated titanium. Neither one made a sound when the glowing alloy caused their flesh to melt and drip away like wax as it was stripped from their mechanical skeletons. They were synthetic organisms designed with the aesthetics of human beings in mind but without the need or ability to experience pain. The first two climbed out of the crater and took a moment to observe their surroundings. A third one emerged dragging the mangled body of the one casualty lost in the crash. Although they moved independently of each other they were not four but one. Thier singular consciousness resided inside the observation vessel drifting above. Everything the machine bodies experienced was relayed and processed by a single digital mind that directed reaction and response. They had no impulses or instincts every action was a response determined by a remote quantum computer. The CPU contained the most meticulously detailed manuals for maintaining and operating the facilities and systems that ran the colony. This system was meant to be the caretaker of the planet until a new generation of settlers could be gathered. Thier human-like appearance wasn’t a simple cosmetic choice. The model was designed with the possibility in mind that it may have to interact with humans. Even on planets where the last vestiges of settled life had disappeared years ago. The Observer ran a self-diagnostics program, and it was determined the three still standing were in still in sufficient working condition. They took a few moments to move and bend their limbs in the same way a human might check for injuries. Thier physical features did not hold up well against the damage. They were a grisly sight. Much of their hair had burnt away. They had patches of flesh charred as black as charcoal. Thier eyes had popped and leaked down their cheeks. One had a hand that had been smashed in the impact. The mangled extremity was missing fingers, and the digits that were still there hung from wires. The arm had a full range of motion, but the hand was useless. Another spat out the oozing remains of a tongue. “Testing one two testing,” He spoke clearly without any movement of the mouth. The mangled fourth body was pulled out of the crater. It was twisted heap of jagged steel coated in the tattered, bloody remains of a flesh coating. It was missing its right leg, and the chest piece had massive fissures that left the more sensitive interior components vulnerable. The remaining organic matter was stripped away. They were built with modular components because they were easy to swap out. The useless body was scavenged for parts. The broken hand was discarded and replaced by the more intact hand taken from the cybernetic corpse. Its shoulder socket was removed and used to replace a damaged one. It was a methodical cannibalization, and not a single part went to waste. A plasma cutter was even used to extricate sensitive microchips that might be of use later. After their new parts had been integrated, they set off for their first objective power station 7. 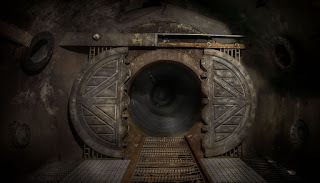 Power stations are uniform structures that all served the same functions but power station seven was where the anomaly was first detected, and it was there the virus was planted that blocked the network from terminating the connection to whatever was siphoning so much power. It was the same virus that was suspected of preventing the release of genetically engineered diseases meant to wipe out the population when the Malthusian protocols were initiated, although that seemed to be an unforeseen consequence rather than intent. “We eat to live” scrawled on the outer wall. This was in sharp contrast to the power station itself. The inornate concrete structure was designed to require very little maintenance. The sloped roof allowed for the runoff of rain water, the barren gray walls were invulnerable to high winds and sturdy enough to withstand most seismic activity, and the turrets that guarded the perimeter kept away any undesired occupants. The building’s mechanized guardians allowed the three safe passage and the locks on the doors automatically disengaged on their approach. The computer watching through the eyes of its cyborg vessels was incapable of feeling relief, but the possibility that the built-in security passes wouldn’t work was a possibility that had been figured into its mathematically based thought process. The sterile interior was devoid of any trace of the technicians and engineers who once worked at the beckoned call of the machines as caretakers. The sterile windowless confines were kept in total darkness to conserve power, but this was no impediment to the mechanical investigators. Thier data included exact floor plans even though this was their first time inside the surrogates knew exactly where everything was. Physically Interfacing with the facility gave the observer information far more detailed than what the digital nervous system of Terranisma could transmit into space. Where the power was going could be traced, the coordinates were cross referenced with what was in the database. The spacecraft had passed over the barren plane just 62 hours ago and had detected no trace of anything that could be consuming so much energy. Whatever was there had been expertly camouflaged. The vast tract of land was once a thriving agricultural site; now it was a depleted sea of dust. The boundless plane was devoid of life the only sound was the low whisper of the wind that shifted the withered soil. A metallic hatch painted to blend in with its surroundings was protruding from the dirt, obviously uncovered by the ceaseless winds. The sealed door took a good deal of time to cut through. The humanoids merely being tools themselves had infinite patience and were impervious to the sting of the particle saturated air as well as the toxic vapor wafting up from the melting steel. 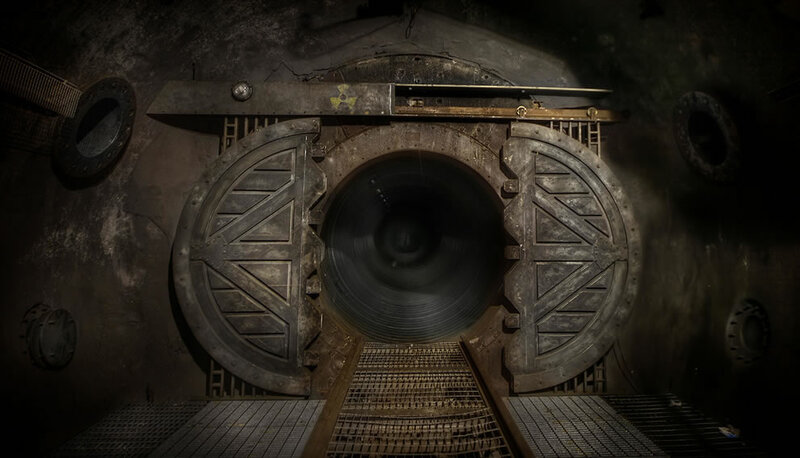 The hatch door was torn off revealing a shaft dug deep into the earth. There were metal bars bolted into the concrete-lined tunnel that formed a ladder. The droids headed down into the sunless chasm. The bottom was 30 meters down. This time the observer had no schematics, floor plan, or data of any kind. The Observer moved cautiously. With the aid of night vision, it was able to navigate the lightless corridor that stretched 25 more meters to a simple fire door. The cell held six coffin-sized machines each one covered with a digital display meant to display human vital signs all of the measurements were flat. The Observer pried open one of the encasement and found a corpse. The dry sterile air had left the body well preserved. The flesh had turned gray and was wilting away on the frail bones. There were electrodes pasted to the temples that wired the body to its mechanical cocoon. The dormant brain stem was merged with the machine. It was a virtual immersion unit the human had died living in a personal digital illusion. The Observer transmitted its findings the power grid was being overloaded by a fantasy world the TerraVitae elites, the trustees of the world had retreated to in the face of disaster. The Observer sealed the corpse back into it the machine and set about decommission the nuclear-powered mausoleum.